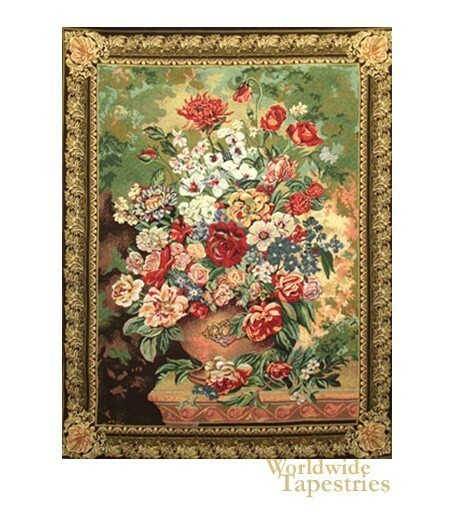 A richly colored and striking collection of flowers is portrayed here in this floral tapestry. Peonies and roses are depicted which are a symbol of romance. The very abundant use of color and the use of a variegated and almost luminous background gives the piece vitality. A rich and opulent border completes this floral tapestry. This tapestry is backed with a lining and comes complete with a tunnel for easy hanging. Note: tapestry rod and tassels, where pictured, are purchased separately. Dimensions: W 24" x H 33"